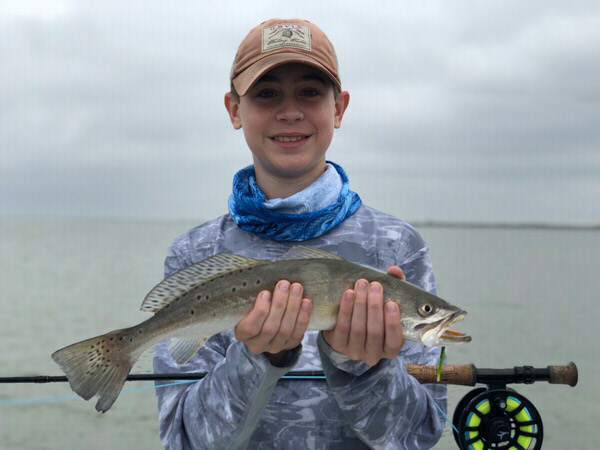 Spotted Sea Trout are a resident gamefish that makes their home on the flats of Texas, and in many locations, year round. Although not as well known as some of the other saltwater gamefish as targets for fly fisherman, they are gaining popularity and definitely are another fish worth pursuing. Although their coloring and body style appears to be quite different, these fish are actually a cousin to the other popular gamefish that can be found in the same habitats, the Redfish and the Black Drum. Spotted Sea Trout have a silver body, that is often dark grey or green on the top, fading to a silver or white belly. It is also known for it’s irregularly placed black spots on the upper portion. What are other names for a Spotted Sea Trout? Spotted Sea Trout are also known as Specs, Trout, Speckled Trout, and Spotted Weakfish, among others. The World Record Spotted Sea Trout was caught in 1995, in Fort Pierce, Florida and weighed in over 17 lbs! An average size for one that is cruising the Texas flats would be 16 – 22 inches and 1-3 lbs. 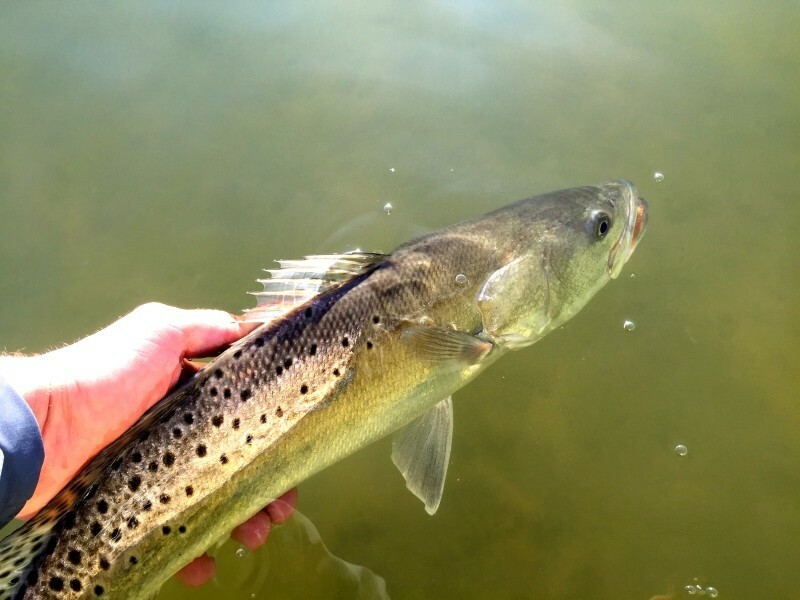 Spotted Sea Trout can be found across the Western Atlantic Ocean from Cape Cod, Massachusetts to Southern Florida, and all through the Gulf of Mexico. 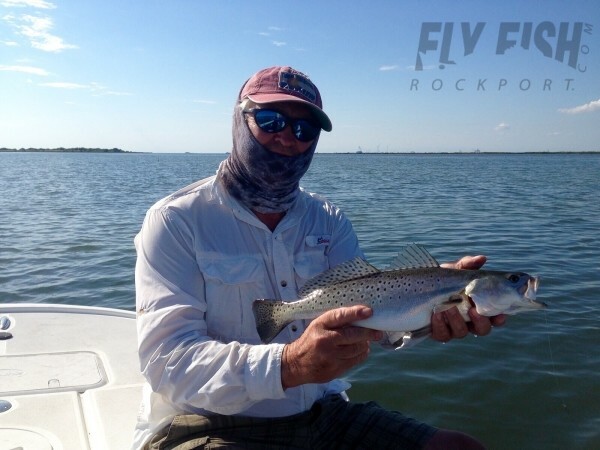 This includes a year-round presence in the Texas Coastal Bend where Fly Fish Rockport sets up their home base. Spotted Sea Trout can be found in coastal waters, estuaries, and and brackish tidal lakes. Usually, they are found over sand bottoms or seagrass beds, however, they have been located in areas with mud or other type of bottoms as well. A unique fact is that these fish must have fresh water in the early months of their lives. Spotted Sea Trout mainly eat baitfish, shrimp, crabs, and other crustaceans. They move in schools and can be found moving into the shallower water to feed. As ambush predators, these fish often lunge after their prey and grab it with their front, sharp canine teeth prior to swallowing it whole. Anglers want to make sure they keep their fingers out of their mouths, as these canines are long, sharp, and can deliver a nasty bite. Are Spotted Sea Trout targeted by anglers? These fish are considered a worthy target by many light tackle anglers, and landing a big one on the fly is certainly a worthy accomplishment. However, due to their light color and different movement and feeding patterns, they are not normally a target for individuals sight fishing the flats. Usually, for fly fisherman, they are an added bonus on a day when out seeking Redfish (hyperlink to that page?) or other more common sight fishing favorites!